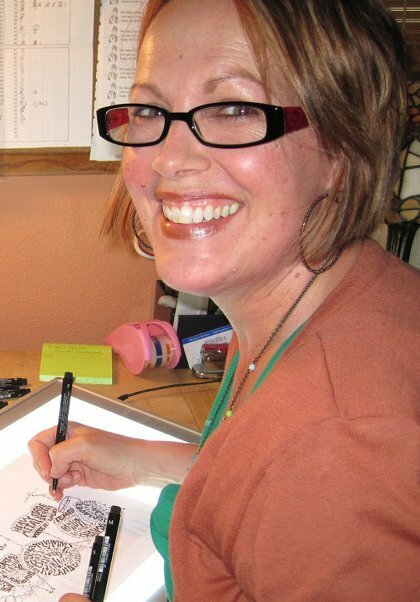 I'm so excited to introduce you to calligram artist, Joni James. Joni and I have been blog buddies for awhile and I've always been fascinated by her artwork. She weaves words and shapes together effortlessly. 1. I love how your art is full of words; it's such a perfect combination. How did you get started doing art this way? I got started in the art of lettering way back in 1991. It was my escape from the noisy house full of kids. It required concentration and gave me a good outlet to savor all those quotes and poems I loved. 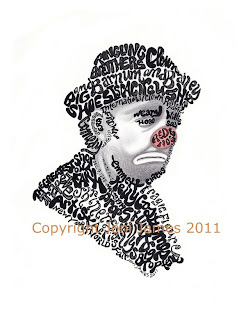 It took about 20 years from there to discover the art of calligrams, which are the pictures made up of words. I must have picked up the idea from a class sometime along the way. They were first originated my Picasso's good friend in the late 1800's. His name was Guillaume Apollinaire. Unfortunately he died at the age of only 38 from the pandemic flu. I never seem to get tired of finding new images to bring to life with words. Right now I'm loving the LED light pad I bought from my local art supply store. I can actually see the image I'm trying to re-create so much easier then using vellum. 3. What advice would you give a new artist? I would have to say that it takes a long time to develop a niche, but every single step to get to that point is so very important and necessary. But, it all depends on what the individual artist really wants. Is creation an outlet for relaxation? Is it created so that you can move away from your daytime job? Would you like to see your art branch out and hit the commercial market? Any reason for creating is the right reason. Just letting it develop into what makes you happy is the most important thing. Barbara Streisand or Diane Keaton. If I was a man I'd want to be Phillip Seymour Hoffman. He's so excellent! haha! Grand Canyon or the Taj Mahal? Grand Canyon! I'm dying to see it up close, not just from an airplane. It's Grand! High heels or flats? I'm definitely a flats girl and always have been. I'm way too tall. In fact, that was my nickname in high school. Too Tall Joni! 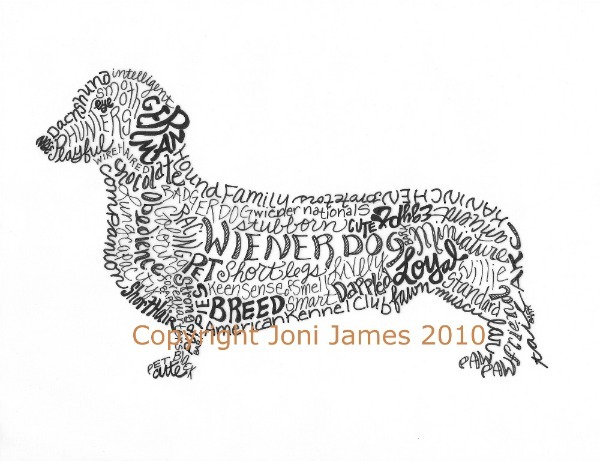 Joni has graciously offered to give away one of her prints (winner's choice)! To enter the giveaway, simply check out her shop CalligramORama then leave the name of your favorite print in the comments below. The giveaway is open until midnight (Central time) on Tuesday, May 22. I'll post the winner here on Wednesday, May 23. You may also visit Joni on her blog. I'm anxious to see who wins! Loved having you and hearing the history of Calligrams! Cool, I never even knew what that type of art was called. I think the images are lovely, and they look very hard to do! I know, isn't is amazing? I would have it lopsided for sure! This is fun! Thank you ikeda! Joni, you are so talented! I love your work. And choosing one to mention? Not so easy. Debating between Tree of Life or Eiffel Tower as my favorite . . . but with my French connection, I'll have to say Eiffel Tower. All around beautiful and AMAZING work! Thanks so much Janet! You're a great support Catherine! I love introducing cool people! I've never read so many wonderful things together in one place in all my life. haha! I love this! Calligram.. had no idea that was what it was called.. thanks for introducing us to her and her wonderful art. Thank you Hena! Love your name too! Awesome blog! Joni does amazing pieces of art! She does. I'm wowed by them. Super fun pieces of art! I must admit my favorites are the vw bug and the dachshund because they both make me think of friends of mine. I think those will be great future gifts. Thanks Cathy for introducing us to her work.